Ireland returned to winning ways when they beat Australia 26-21 in Melbourne on Saturday to level the three-Test series at 1-1. The Six Nations champions dominated for large periods – especially during the second half – and were deserved winners even though their hosts outscored them three tries to two. It means that the Test series will go down to the wire in Sydney next weekend and after an impressive all-round showing in Melbourne, Ireland will fancy their chances of securing back-to-back victories over their hosts. The Wallabies made a terrific start and opened the scoring as early as the second minute when Kurtley Beale dotted down after running onto a pass from Bernard Foley, midway between Ireland’s 22 and the halfway mark. Beale still had work to do but did well to cut through Dan Leavy and CJ Stander and then beat Rob Kearney before dotting down under the posts. Foley added the extras but the home side were dealt a blow five minutes later when Marika Koroibete was yellow carded for a tip tackle on Kearney. Ireland made full use of their numerical advantage as shortly afterwards Conor Murray attacked off the back of a scrum inside Australia’s 22 and threw a long pass to Andrew Conway, who rounded off in the right-hand corner. Johnny Sexton slotted the conversion and he gave the visitors the lead courtesy of a penalty in the 13th minute after the Wallabies were blown up for illegal scrummaging. Ireland continued to dominate although Australia did not help their cause by conceding a plethora of penalties and when it was within goal-kicking range Sexton made them pay, and he added two further three-pointers off the kicking tee to give his side a 16-7 lead midway through the half. Australia needed a response and that came in the form of a penalty try in the 27th minute after Cian Healy illegally halted a Wallabies drive close to his try-line and the veteran front-row also received a yellow card for his indiscretion. Australia could not add any points during Healy spell on the sidelines, however, and the teams changed sides at half-time with Ireland holding a slender 16-14 lead. Ireland came out firing in the second-half and were soon camped inside the Wallabies’ half. In the 53rd minute, Keith Earls burst through a tackle from Israel Folau before going over the home side’s try-line, but the TMO ruled that he lost control of the ball while crossing the whitewash. Ireland continued to attack and were rewarded three minutes later when Tadhg Furlong powered through a tackle from Nick Phipps before crashing over for his first Test try. That five-pointer was a deserved one for the prop who was arguably the best player on the field up to that point. Sexton’s conversion meant Ireland led 23-14 and they pulled further ahead when he added his fourth penalty after the Wallabies were blown up for a breakdown infringement. 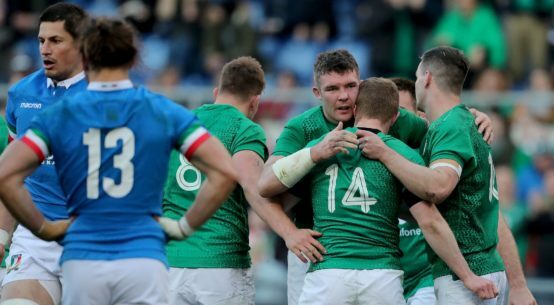 The home side spent most of the game’s closing stages camped inside Ireland’s half and were handed a lifeline in the 77th minute when Jack McGrath was also sent to the sin bin, after playing the ball on the ground deep inside his 22. Australia launched several attacks during the game’s closing stages and were rewarded shortly afterwards when Taniela Tupou barged over from close quarters. But although they tried to haul in their visitors at the end, it was not to be as Ireland kept them out with a solid defensive effort.